Want to join America's Finest Fleet? Solar Transport was founded in 1963 by W. A. Krause and Tony Gentle in Hampton, Iowa. Starting with one truck our founders had a single purpose: to be the best in the business. Today Solar Transport upholds that tradition of working every day to be the very best it can be. The company grew organically from the single truck to a fleet of fourteen trucks by 1990. In the 1990's the company grew through a number of small and mid-size acquisitions and become a regional carrier, serving the Midwest. By 2004, the company had grown to a fleet of 70 tractors and was producing $20MM in annual revenue. In 2005, the company embarked on a significant strategic growth plan that grew the company to over $60MM in annual revenue by the end of 2014. During that period, the company expanded operations to Colorado, Wyoming, Arkansas, Indiana, and California. Today's operation consists of over 200 tractors, 230 trailers and over 350 drivers in 13 states. With a footprint from California to Indiana and South Dakota to Arkansas, Solar is uniquely positioned to serve national and large regional customers. Solar Transport currently serves some of the largest convenience store chains in the nation from 27 terminals, with regional offices in Iowa, Colorado, California, and Missouri. To be the best, use the best. We are in constant pursuit of new technologies that can simplify and improve all facets of our business while providing the ultimate safety and convenience for our drivers. Our team strives each day to improve the Solar delivery system in order to better support our clients. This includes professional training for our team and integrating a technology suite that utilizes the best of TMW® transportation software coupled with PeopleNet Mobility Solutions. This allows us to control inventories, track arrivals and departures, and give our customers information that helps them better manage their business. The better we are at understanding and delivering what our customers need, the more productive and profitable they will be. By the same token, the better we are, the happier and more fulfilled will be the lives of our associates and their families. Our safety-conscious drivers and passionate customer service associates will take care of the fuel, transport and logistics needs of your business - delivering impeccable service with a warm, personal touch. 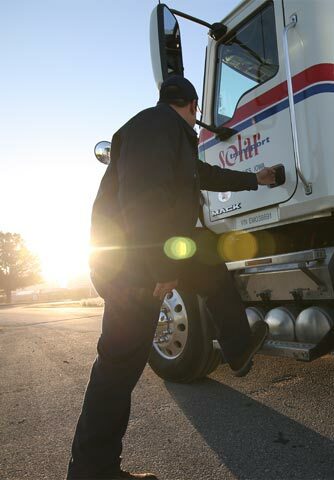 Every day, Solar associates are energized to find the best way to deliver to our customers safely and on time, every time.